We recently asked the question, are bees actually pests? Bees are actually very important creatures, that pollinate over 70% of the world’s food crops. This not only helps the environment, their work also aids in feeding the human population. A big task! However, they can be unwanted around the home, especially when they build hives in doorways, corridors eating areas and places where children are playing. These hives can be intimidating, even life-threatening for people who suffer an allergic reaction to bees. However, sometimes what we perceive as a hive is actually the result of some disturbance, or change, within the colony, resulting is what is call “swarming”. So, what does a bee swarm look like? At Right Pest Control, we often get calls about large, angry-seeming masses of bees on houses and properties in Melbourne’s north and eastern suburbs. Often the customer has noticed a mass of bees in a cluster the size of a football, buzzing around in quite a frantic manner. Although this can look like a beehive, it’s likely to be a swarm of bees. Swarming is a natural phenomenon that usually occurs during springtime over a period of two to three weeks. Simply, it could be described as the process in which a single colony multiplies to make two or more colonies. With springtime fast approaching, we can expect to see swarming soon on properties in Melbourne. What we are seeing when we witness a bee swarm is the method by which a new honey bee colony is created. This is usually the result of the queen bee deciding to leave the original colony with a large group of her workers in tow; in a large swarm, about 60% of the workers follow her, with afterswarms sometimes continuing until a beehive is almost totally depleted of workers. The swarm can contain thousands to tens of thousands of bees, which makes it unsurprising that their gathering in your driveway, porch or ceiling can be too close for comfort! Due to the huge number of bees involved in these swarms, bee removal is dangerous if you are inexperienced. This is especially the case if you suffer from an allergy to bees known as anaphylaxis. For this reason, once you find a swarm, it is best to contact a professional who can safely remove the bees and rehome them. Whilst the bees are in a swarm they can actually be quite easy for us to remove, but by the time a colony has made itself a home from something or somewhere unusual it can be quite a task to remove them, depending on the entrance and position of the hive. There are various methods used by pest removalists who have experience with bees to dispel a swarm. 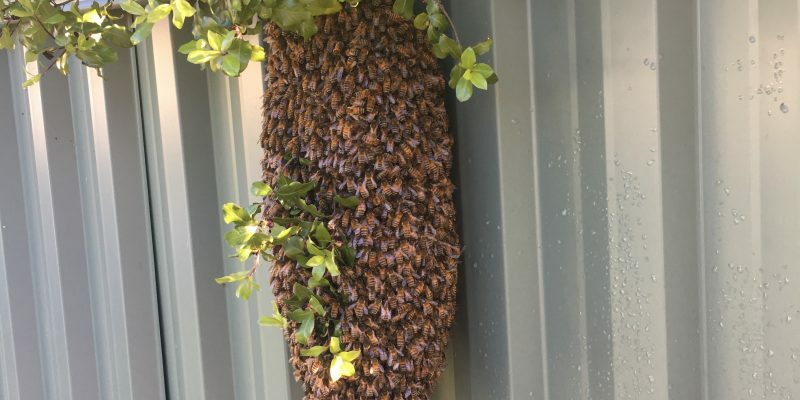 In any circumstance when you find a swarm, contact the knowledgeable pest removalists at Right Pest Control on 0478 308 361. We will remove, and rehome, bee swarms and hives from your house or property in Melbourne’s northern and eastern suburbs. This family owned & run business has over 15 years of pest control experience right here in Melbourne. Right Pest Control Melbourne is proud to be a leading pest control company that can take care of all your pest control needs. We only provide the safest and most effective pest control methods in both domestic and commercial environments. Our highly trained Pest Control Melbourne Technicians are fully licensed to identify and eradicate all pests in and around your home or business.